You hear “muffin top” and you immediately think of the unwanted fat that sticks out of people’s too-tight jeans. But here’s a fun baking ‘toy’ to have fun with and help lose your muffin top. These silicon shapes are placed on top of a muffin before going in the oven to give it a fun muffin top shape including diamond shaped tops, bundt shaped tops and simple circular shaped tops. 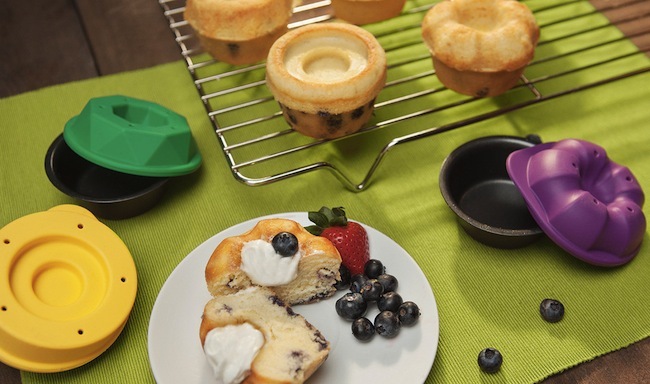 The best thing about this is that the baking mold forms a little crevice in the middle of the top which you can stuff with anything from fresh cream to fruit. I have started using these and am now OBSESSED! My two favorite muffins to make are banana-chocolate muffins, and blueberry muffins. Mix the oats, flour, unsweetened cocoa powder, bananas, baking powder, salt, milk and the egg, then bake in the oven at 180 degrees celsius for 18- 20 minutes. For blueberry muffins, mix 1 1/2 cups of oats, 3/4 cups of flour (all-purpose or whole grain), 1 cup of milk, 1 egg, 1 tablespoon of baking powder, and as many blueberries as you want, then bake in the oven at 180 degrees celsius for 18- 20 minutes. If you want a little bit of a spiciness, sprinkle a bit of cinnamon on top before sticking them in the oven. Both these muffin recipes are healthy, easy, and delicious options for a quick and healthy breakfast on the go; plus, who doesn’t love fun shaped muffin tops? !